Elias is a small, rural church in the township of Herman near Gresham that was started by German Lutheran homesteaders over 125 years ago. The first services took place in people’s homes, led by a traveling pastor. Lay people often took charge of the service when he was unable to come. These small initial gatherings led to the formal organization of the Evangelical Lutheran Elias Society on February 3, 1881. Services were then held in a log schoolhouse. When the group became too large for the school, a faithful member gave 4 acres of land for a church and cemetery and in 1883 a log church was built. In 1891, the people of Elias desired to join with another area church and be served by their resident pastor. Elias called its first pastor in 1893. In 1894, the people decided to build a new church of brick. Work started in early 1899 and on November 18, 1900, the new brick church was formally dedicated. Over the years, this congregation has grown in faith, hope, and love, working together to enrich all the members of God’s family. In June of 2000, we became a member of a seven-point cooperative parish, The United Lutheran Parish. This unique organization has enabled us to remain a viable and growing church with more shared resources to better serve our members of all ages. 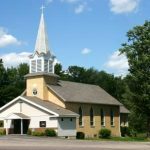 Elias Lutheran has been a strong presence in this area, filled with dedicated, committed, and faithful members, a church that lives as the family of God. Together as members and friends, we are encouraged to serve God in this world by worshiping together in a spirit of fellowship and caring. We, the descendants of those early settlers, invite you to visit and join us in our worship. ~Services are held each Sunday at 8:15 am. ~Holy Communion is celebrated on the 2nd Sunday of the month. ~In addition, there are special services on Christmas Eve, Lent, Holy Week, and Thanksgiving. ~Elias provides educational opportunities for people of all ages. ~Sunday School is for those 4 years of age and up. Classes run from September to May and are held each Sunday in the Church from 9:00 am to 9:45 am. ~Adult classes are held at various times throughout the year. ~Vacation Bible School is usually held each year in June or July for children 4 years old through 8th grade. ~1st Communion classes are offered to those in 5th grade. The parents, the child, and the pastor decide readiness for 1st Communion. ~Confirmation Ministry runs through the school year for those in 7th & 8th grade with Confirmation being held on the 4th Sunday in June. ~A new faith-based youth program is under development to better minister to our youth and to provide them with opportunities within the church to serve and participate more fully. ~Elias Altar Guild faithfully prepares the Lord’s Table and sanctuary for worship and celebration. They are responsible for the care of all our banners, altar paraments and communion supplies. They also decorate the church for various holidays and special events. ~Many of the men of Elias participate in a men’s dartball league, providing recreation and fellowship. ~Elias WELCA (Women of the Evangelical Lutheran Church in America) is a well-established organization in our church, offering an opportunity for all women to become involved in the service of caring for the church and its congregation. The WELCA meets monthly for Bible study and fellowship and they are active in the community, helping those who are in need. They have many projects each year, including gathering many items for Lutheran World Relief. They are an asset to the congregation, providing good leadership, a willingness to serve, and other assets. ~Elias is a church with a focus on mission. From this small rural congregation we support two missionaries who serve with Lutheran Bible Translators. We regularly support Lutheran World Relief, World Hunger, Lutheran Social Services, and our church food pantry. ~Elias is a church that sings, enjoying many of the old favorites. We are also blessed with 2 organists that provide us with inspirational music that makes our worship complete. COME AND JOIN US IN WORSHIPING, PRAISING, AND SERVING OUR GOD!